While guest hosting Fox's "straight news" program, Special Report, Shannon Bream did a report suggesting that the estate tax hurts small businesses and therefore causes the economy to hemorrhage jobs. But the report failed to mention that a vanishingly small number of businesses and individuals are subject to the estate tax. Fox's Bream Portrays Estate Tax Cut As A Way To "Save The Economy"
BREAM: We continue our look at the ways to save the economy by focusing tonight on the estate tax, how it affects small businesses and the people whose livelihoods depend on them. Bream Suggests Higher Estate Tax Rates Would Put Many More Small Businesses At Risk. BREAM: Small business owners have no idea what may happen when the current rates expire at the end of 2012. DAVID LOGAN (Tax Foundation economist): There's strong evidence to suggest that higher estate taxes lose jobs, just to put it bluntly. BREAM: For now, family-held small businesses say they're left to wonder whether law makers will once again reach an 11th-hour deal on estate taxes, leaving them hesitant to expand or invest until they get that guidance, meaning it's up to Washington to convince them to get off the sidelines. LOGAN: It's part of a comprehensive tax reform. And that's what we're hoping for. That's what will alleviate that uncertainty that goes to small businesses. Bream's Report Contained No Pushback To The Claim That Estate Taxes Severely Hurt Small Businesses. Despite the fact that Special Report is supposedly one of Fox's straight news programs, Bream did not present any argument in favor of not cutting estate taxes during the segment. More than 40,000 estates worth $1 million to $10 million would be expected to escape inheritance taxes next year under the deal struck by Republicans and President Barack Obama. The package would leave only about 3,500 of the largest estates subject to federal taxes next year, a boon for the wealthy that many House Democrats say they can't accept. The federal estate tax reaches fewer than 1 percent of inheritances, but it has long been a political lightening rod among lawmakers from both parties. Many Republicans want to eliminate the estate tax altogether, derisively calling it a "death tax" that makes it hard for parents to transfer small businesses to their children. Estate tax opponents got their wish this year, when the tax was temporarily repealed. But the tax holiday will be short-lived because, under current law, the estate tax is scheduled to return next year with a top rate of 55 percent for estates larger than $1 million for individuals and $2 million for married couples. The package Obama negotiated would set the top rate at 35 percent and exempt the first $5 million of an individual's estate. Couples could exempt $10 million. At those levels, the tax would affect just 0.14 percent of all estates in 2011, or about 3,500 estates, generating about $11.2 billion in revenue, according to an analysis by the Tax Policy Center, a Washington research group. A commonly expressed concern is the effect of the estate tax on family farms and small businesses, including the possibility that heirs may be forced to liquidate the business to pay the estate tax. As with the general public, most owners of family farms and small businesses are unlikely to owe estate tax. About 2.1 percent of farmers (1,137) and 2.4 percent of small-business owners (8,291) who died in 2005 had to file estate tax returns. 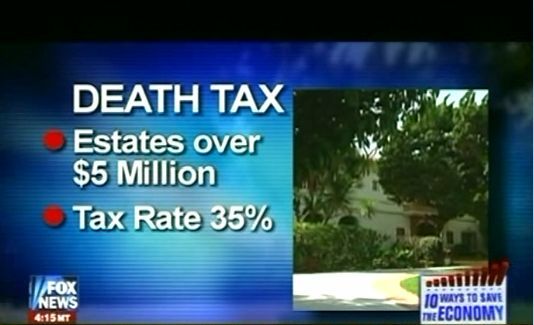 Supposed Straight News Special Report Refers To Estate Tax As "Death Tax"
By 1994, Newt Gingrich's Republican insurgents had latched onto the estate tax issue, but the Contract With America called for an estate tax reduction, not repeal. In 1995, Luntz poll-tested the term "death tax" and advised the new GOP majority to never use the terms "inheritance" or "estate tax" again.